Henry David Thoreau was a writer from Concord, Massachusetts who was a part of the transcendentalist movement in the 19th century. He is most famous for his book Walden which is about his two-year experience of living in a cabin at Walden Pond in Concord. Where Was Henry David Thoreau Born? Henry David Thoreau was born on July 12, 1817 in a farmhouse, known as the Minot house, on Virginia Road in Concord, Mass. 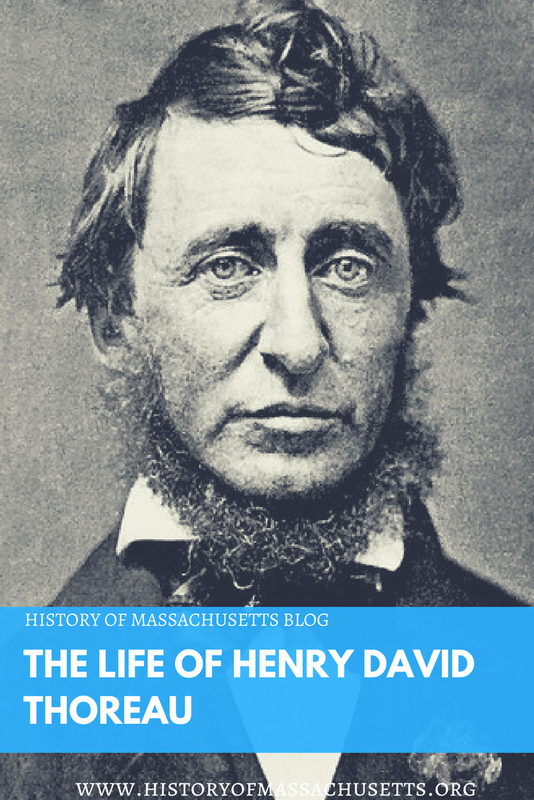 Thoreau was actually born David Henry Thoreau but began calling himself Henry David after finishing college, although he never legally changed his name. Thoreau’s parents were John Thoreau and Cynthia Dunbar. Henry David Thoreau had three siblings: Helen Thoreau, born 1812, John Thoreau, Jr, born 1815, and Sophia Thoreau, born 1819. John Thoreau, Sr, was the son of a French Protestant immigrant, Jean Thoreau. Jean Thoreau was born at St. Helier, Isle of Jersey, in 1754 and immigrated to America in 1773. The Thoreau family left the farm where Henry David was born when he was about a year old and moved to Chelmsford, Mass for two years and then moved to Boston for three years before finally returning to Concord. Henry David Thoreau’s family struggled financially until Henry’s Uncle Charlie stumbled upon a graphite mine in New Hampshire in 1821. Charlie put a claim in on the mine and he and Thoreau’s father went into business together using the graphite to make pencils. After Charlie lost interest and dropped out of the business it became the John Thoreau & Co. The pencils were high acclaimed and won awards for their high quality, bringing the Thoreau family financial stability. 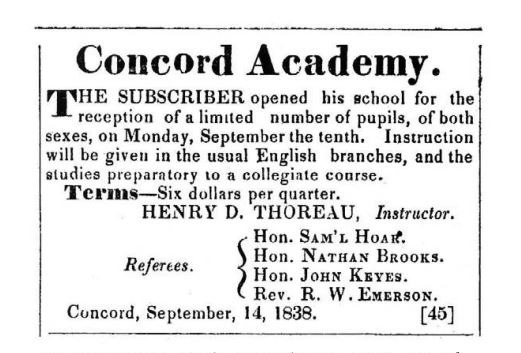 Thoreau attended an overcrowded public grammar school in Concord before entering Concord Academy with his brother John in 1828. When Thoreau wasn’t in school, he was outside exploring nature and taking long walks in the woods and fields with his parents, who were also nature lovers. Thoreau’s friend, Horace Hosmer believed Thoreau’s love of nature came from his parents. Thoreau had a knack for mechanics and construction. According to Channing, when sudden rain storms would threaten his walks in the woods, Thoreau could build a makeshift shelter in a matter of minutes with nothing more than a knife. Thoreau also built his own boat, at age 16, which he called “the Rover” and used it to row along the Concord river, then built another boat with his brother John, which he used on his trip up the Merrimack River in his book A Week on the Concord and Merrimack Rivers. In addition to boats, Thoreau also made pencils, built fences, finished barns and built bookcases. After finishing his final year at Concord Academy in 1833, Thoreau reluctantly began to prepare to go to Harvard University. Although his father suggested he become an apprentice to a carpenter or cabinet-maker, his mother insisted that he get the best education he could. He took the entrance exams that summer and barely passed. Tuition to Harvard at the time was $55 a year and with textbooks and room and board it came to $179. This was more than his parents could afford so his entire family, including his siblings and two aunts, pitched in to help. While at Harvard, Thoreau studied multiple languages and sat in on lectures on German literature by Henry Wadsworth Longfellow. At the time, Harvard allowed students to take 13 weeks off from school in order to teach and earn money for tuition. From December of 1835 to March of 1836, Thoreau taught students at a school in Canton, Mass. In May of 1836, Thoreau became ill with what historians now believe was his first bout of tuberculosis. He became so weak and exhausted that he couldn’t return to Harvard. He spent the summer building a new boat, which he named Red Jacket, and took a trip to New York with his father to sell their pencils to local stores. Thoreau returned to college in the fall but was frequently plagued by illness. He made it through his senior year and graduated with a bachelor of arts on August 30, 1837. After graduating, Thoreau returned to Concord and took a job as a teacher at the public grammar school he attended as a child. The job only lasted two weeks though because he refused to use corporal punishment to control the children in his class. After being pressured to punish some of the more unruly children, he did so and then promptly quit his job that evening. Thoreau tried to find work in other schools but an economic depression had begun in the U.S., triggered by the panic of 1837, and there were few jobs to be found. To make ends meet, Thoreau took a job in his father’s pencil factory and used his knack for construction and his love of reading to find a new way to improve the pencils, which led to a surge in sales. Some sources say Thoreau first met Emerson in February of 1835 at Harvard where Emerson was giving a lecture, but the two were not close friends yet. It was through Emerson that Thoreau met many other Concord writers such as Nathaniel Hawthorne, William Ellery Channing and Louisa May Alcott. It was in October of 1837 that Emerson suggested to Thoreau that he keep a journal. Thoreau took his mentor’s advice and wrote his first journal entry on October 22, 1837. He continued writing in his journal for the rest of his life, writing over two million words that eventually filled up about 14 volumes. These journals were later published after his death. In the fall of 1838, Thoreau opened his own private school with his brother John. It was first held in their own home but then moved to the deserted building of the Concord Academy. It was a coeducational school made up of local students as well as children from out of town who boarded with the Thoreau family. One of its many students was a young Louisa May Alcott who began attending the school in 1840 when she first moved to Concord with her family. The school didn’t use physical punishment and adopted new and radical educational methods. Henry taught language and sciences while his brother John taught English and math. The Thoreau brothers took their students on frequent field trips to the local fields, woods and ponds as well as to the local businesses, such as the newspaper office and the gunsmith, to learn how they operated. The school earned such a great reputation that there was soon a waiting list to enroll. During the summer of 1839, Henry and John built a boat and sailed up the Merrimack River to the White Mountains of New Hampshire for a two week trip. The two slept on buffalo skins in a cotton tent, hiked in the woods and climbed Mount Washington. The trip made such an impact on Thoreau that it became the basis of his first book, A Week on the Concord and Merrimack Rivers, which he published in 1849. The following year, in November of 1840, they both proposed to her, first John and then Henry. Sewall at first accepted John’s proposal, but upon realizing that it was Henry that she actually had feelings for, she broke off the engagement. Henry then proposed and, upon conferring with her father, a minister who disapproved of both Thoreau brothers as a suitable match, she informed Henry that she could not marry him. A few years later, Sewall married a young minister named Joseph Osgood. Various sources say that both Ellen and Henry still had feelings for each other for the rest of their lives. Thoreau soon began to publish his writing more and more around this time. He began to give lectures at the Concord Lyceum and also published poems and essays in Emerson’s transcendentalist newsletter The Dial. When John Thoreau, Jr, became ill in 1841, Henry David couldn’t continue their school on his own and closed it down in April. 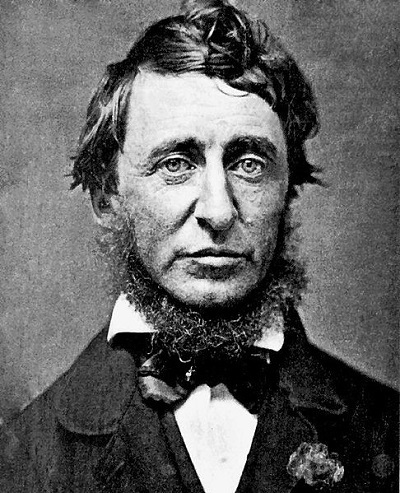 Henry David Thoreau was invited to live with Ralph Waldo Emerson and his family at their house where Thoreau did odd jobs in exchange for room and board. On New Years day in 1842, John Thoreau cut his finger while shaving and soon became sick with tetanus and lock jaw. He died 11 days later in his brother’s arms. Thoreau was sick with grief and soon begin to exhibit symptoms of lockjaw himself although he hadn’t received a cut. He recovered a few days later but was depressed for months. Many historians believe he was exhibiting symptoms of a psychosomatic illness. Thoreau and Hawthorne quickly became friends and Thoreau sold him one of his rowboats for seven dollars and took him out on the Concord River to teach him how to operate it. In May of 1843, Thoreau took a job tutoring one of Emerson’s relatives in Staten Island, New York. He hoped to make connections with editors and publishers in New York but made little headway and by the fall he was so homesick for Concord that he resigned, returned home and went back to work at his father’s pencil factory. In April of 1844, Thoreau accidentally started a forest fire in Concord while on a camping trip on the Sudbury River with his friend Edward Hoar, son of local Judge Samuel Hoar. The fire occurred when the two came ashore to make a camp fire and cook some fish they had just caught when a stray spark from the fire set the dead grass on fire. The flames quickly spread up the hill and were soon out of control. The two men ran for help but it was too late. More than 300 acres burned resulting in two thousand dollars worth of damage to three local landowners. The local newspaper reported on the fire and chided the “thoughtlessness of two of our citizens” for causing the blaze. The paper didn’t identify the men but because Concord was such a small town, word got around that it was Thoreau and Hoar. Thoreau later wrote in his journal that for years after the incident the locals harassed him by calling out “burnt woods” wherever he went. Thoreau began building his cabin at Walden Pond in March of 1845 and moved in a few months later on July 4. 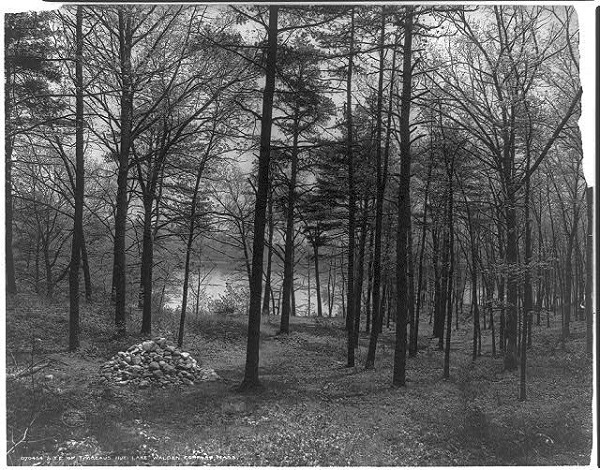 The cabin was built on the edge of 14 acres of land owned by Ralph Waldo Emerson on the northwestern shore of Walden Pond. In July of 1846, while living at Walden, Thoreau was arrested by the local sheriff for failure to pay a poll tax. The poll tax was actually a local tax but Thoreau believed it was a federal tax used to fund the Mexican-American war, which he opposed, and had stopped paying it in 1842 in protest. Although Thoreau hadn’t paid the tax in four years, the sheriff was slow to respond to this and didn’t even arrest Thoreau until that summer after Thoreau came into town one day to have his shoes repaired. Nonetheless, he reluctantly left his jail cell. The experience later inspired Thoreau to write his essay Resistance to Civil Government, which was later renamed Civil Disobedience, in which he argues that it is sometimes necessary to disobey the law in order to protest unjust government actions. Thoreau left Walden Pond in the autumn of 1847 and moved in to Emerson’s house to help care for his family while Emerson was away in Europe. Thoreau gave his Walden cabin to Emerson who then sold it to his gardener. A couple of years later, two farmers bought it and moved it to the other side of Concord to store grain in it. In 1868, the farmers dismantled the house for the lumber and put the roof on an outbuilding. Thoreau continued writing and, in 1849, published his first book, A Week on the Concord and Merrimack Rivers, which chronicled his boat trip to the White Mountains with his brother in 1839. He had to pay for the publishing costs himself and when the book didn’t sell, his publisher, James Munroe of Boston. returned the remaining seven hundred copies to Thoreau. Although successful, it took five years for Walden to sell 2,000 copies and it was out of print by the time Thoreau died less than a decade later. In 1858, Thoreau became embroiled in a feud with James Russell Lowell, a Boston writer, diplomat and editor of the Atlantic Monthly Magazine, after Lowell published Thoreau’s essay “Chesuncook” and omitted a line about the immortality of a pine tree. Thoreau apparently became angry when he discovered it and sent Lowell a fiery letter and refused to contribute to the magazine while Lowell was still editor. This feud continued even after Thoreau’s death a few years later when Lowell published an essay attacking the deceased writer. Thoreau also took a month long trip to the midwest in the summer of 1861 and explored the area around the Twin Cities in Minnesota with his friend Horace Mann, Jr. It was the last trip outside of Massachusetts that Thoreau would ever take. How Did Henry David Thoreau Die? One night in December of 1860, Thoreau, who had been plagued by tuberculosis for years, got caught in a rainstorm while counting the rings on a tree stump and he became ill with bronchitis. His health began to decline and, although he had brief periods of remission, he eventually became bedridden. He spent his last years revising and editing his work and continued to write letters and journal entries until he became too weak. 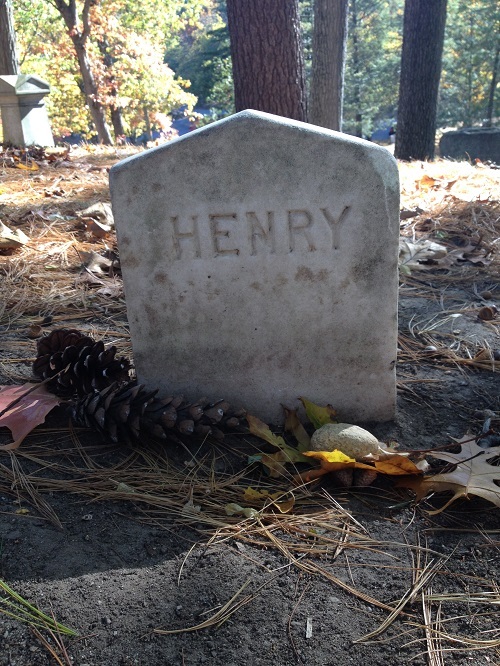 Where is Henry David Thoreau Buried? Thoreau was buried in Sleepy Hollow Cemetery in Concord, Mass. He was originally buried in the Dunbar family plot in the lower half of the cemetery, but his grave was relocated in 1870 to Author’s Ridge towards the back of the cemetery to be closer to the graves of his writer friends Emerson, Alcott, Hawthorne and Channing. Sanborn, Franklin Benjamin. The personality of Thoreau. Charles E. Goodspeed, 1901. Meltzer, Milton. Henry David Thoreau: A Biography. Twenty-First Century Books, 2007. Channing, William Ellery. Thoreau, the poet-naturalist. Charles E. Goodspeed, 1902. Dean, Bradley P. and Gary Scharnhorst. “The Contemporary Reception of Walden.” Studies in the American Renaissance, 1990, pp: 293-328. Hi, I wanted to bring to your attention there are Henry David Thoreau Forever Stamps available. With this stamp, the U.S. Postal Service® celebrates writer, philosopher, and naturalist Henry David Thoreau (1817–1862). For more information, please visit the Postal Store® at http://www.usps.com or call (800) 782-6724.